For Yves Saint Laurent, each woman’s beauty is unique. And there are many ways to interpret it in order to express the eternal woman reinvented. By turns mysterious, flamboyant, romantic, an ingénue and a seductress, the Yves Saint Laurent woman has a thousand faces and a thousand smiles. She is a modern-day heroine, liberated, daring and surprising. With her innate elegance, she adapts to every moment in her life, and this is what makes the Yves Saint Laurent woman so desirable. 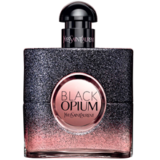 A modern take on the original best-seller Opium, Black Opium is filled with elements of mystery and energy. Top notes: pink pepper and orange blossom, middel notes: jasmine and coffee and base notes: vanilla, patchouli and cedarwood. Price: R975 Size: 50ml Availability: Selected department stores.